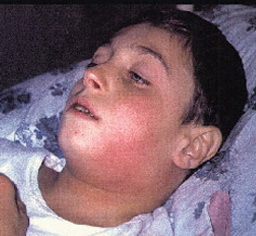 Diphtheria is a bacterial infection which attacks the mucous membranes in the nose and throat. Sometimes these infections can also affect the skin. Disease diphtheria is included in the highly contagious and deadly disease. However, fortunately diphtheria can be prevented by immunization or vaccination. Do you know that 90% of the people infected in that case did not have a history of diphtheria immunization are complete? This shows that it is important to have a diphtheria vaccine to prevent outbreaks of contagious diseases on this one. Diphtheria is a respiratory tract infection caused by the bacterium Corynebacterium diphtheriae. These bacteria produce poisons that can kill healthy cells in the throat. These dead cells then form a thin gray membrane in the throat. In addition, this poison can also spread in the bloodstream and damage the heart, kidneys, to the nervous system. 1. Inhale the spit of the patient's saliva in the air when the patient sneezes or coughs. This is the most common method of transmission of diphtheria. 2. Goods that are already contaminated by bacteria, such as toys or towels. 3. Touch directly on wounds ulcers due to diphtheria in the skin of sufferers. Transmission generally occurs in people with living in a dense population and environmental hygiene is not maintained. 10. Signs of shock, such as a skin that is pale and cold, sweating and heart pounding fast. Sometimes there are several symptoms of diphtheria which does not appear or even symptoms of diphtheria of other that are outside of the list. Immediately consult a doctor if you feel to have symptoms that resemble the symptoms of diphtheria. There is no way to prevent diphtheria is most effective in addition by doing vaccines or diphtheria immunization. Diphtheria vaccine himself went in the compulsory immunization programmed incorporated in the Government-owned vaccine DPT which include Diphtheria, Tetanus, and Peruses (whooping cough). DPT vaccine is generally done by as much as 5 times at a time when children aged 2 months, 3 months, 6 months, 1.5 years, and 5 years. However, after it required booster with Tdap/Td vaccine at the age of 10 and 18 years of age and is repeated every 10 years more for prevention. Then what if you haven't done a diphtheria vaccine at all? There are still chase immunizations that you can do. There is still a type of Tdap vaccine that can be used in children who are over 7 years old. This immunization or vaccination will protect you from Diphtheria for life. How to treat diphtheria is by killing bacteria and also heals infections that can make. For this are the necessary antibiotics as bacteria killers. In the early phase, the patient may be placed on the isolation room for two days, and then the consumption of antibiotics continued until 2 weeks although the patient has been removed from isolation. After 2 weeks of laboratory checking will be performed. If diphtheria bacteria are still found, antibiotic use can be continued for up to 10 days. In addition to antibiotics, patients will also take antitoxin drugs to neutralize diphtheria toxins in the body. If the patient has difficulty breathing due to the gray membrane blocking the throat, the removal of the membrane is needed. Gray membrane resulting bacterial diphtheria not can only inhibit the respiratory tract by covering the throat; these membrane particles also can get into the lungs and trigger pneumonia. If this happens, not only will the lung function decline, failing a breath is also very likely to happen. 2. Damage to the heart. A toxin produced diphtheria bacteria is also potentially infect the heart and makes the heart muscle inflammation. This has resulted in an unstable heartbeat, heart failure, sudden death is up to. The various consequences of diphtheria toxin is difficulty swallowing, problems of the urinary tract, or the complete paralysis on the diaphragm, as well as swelling of the nerves of the hands and feet. Especially on the diaphragm will make the patient can't breathe so requires breathing AIDS. Diaphragmatic paralysis can occur suddenly at the onset of symptoms or weeks after the infection has healed. Therefore, diphtheria sufferers of children who experience complications are generally recommended to remain in the hospital for up to 1.5 months. The most severe diphtheria complications are hyper toxic diphtheria which can lead to severe bleeding to kidney failure. This one complication has the same symptoms as diphtheria in general. Understanding more about the causes of diphtheria and how to prevent using vaccines is important to prevent the spread of epidemics from diphtheria. To increase endurance, always consume healthy and clean foods. Also consume vitamins and do sports activities to maintain immunity.